Our Rehoming Centre wouldn’t be the success it is without the help of our dedicated team of volunteers, many of whom have been with us for years. Our volunteers give their time freely, for the benefit of the animals in our care. 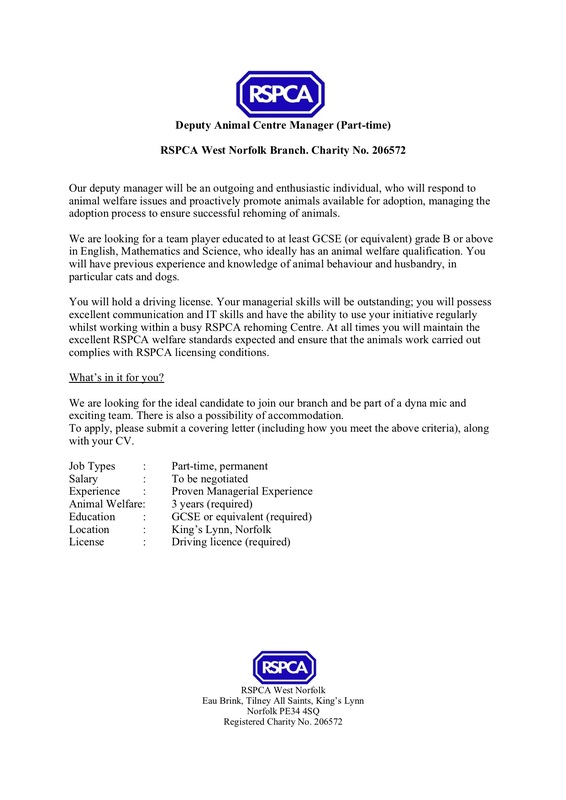 We are currently recruiting for new dog walkers. We need fit, active and capable people over the age of 18 to join our band of volunteer dog walkers. The role entails giving up a few hours of your time to spend with our dogs, taking them out for approximately 20 minutes at a time, and in all weathers! We have a variety of dogs in our care, each with different exercise requirements, but all needing some quality time out of the kennel and some one-to-one attention. Our dog walkers attend every day of the week, on either an ‘early’ shift 8.30am-11.30am or a ‘late’ shift 11.30am-2.30pm. We ask that you are able to commit to one (or more) of these shifts on a regular basis so that we can plan our dog walking rota effectively. We are currently in need of people who can walk during the late shift especially at the weekend. If you would like to volunteer please contact the Office on 01553 618889 or pop into the Centre during opening hours (Mon-Sat 11am-3pm). You will need to complete a volunteering form and advise us of the shift/s you are able to cover. We will then arrange a date for you to attend for an induction. Inductions will be held twice a month and last approximately one hour. Once you have completed your induction we will be able to include you on the Team as soon as we have an opening for the hours you have available. Volunteering is extremely rewarding for a number of reasons and we have a lovely family atmosphere within the Centre. All our volunteers have a great love for the animals in our care and gain huge satisfaction from the part they play in every successful adoption. 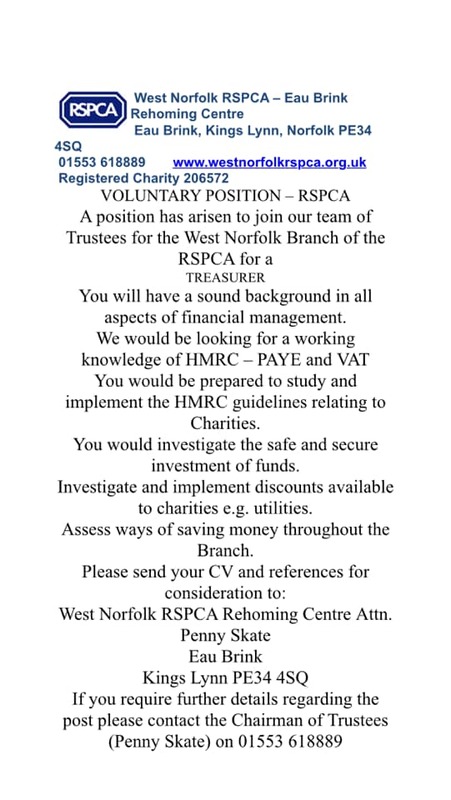 If you would like to join our team, please get in touch. Our Rehoming Centre wouldn’t be the success it is without the help of our dedicated team of volunteers, many of whom have been with us for years. Our volunteers give their time freely, for the benefit of the animals in our care. We are currently recruiting for new cat cuddlers. Most people know about our dog walking volunteers but fewer people know that we also have a small team of people who come to the Centre regularly to ensure that our cats get some individual attention too. Our cat cuddlers spend time sitting in the heated pens with the cats, talking to them, grooming those that need it, and playing with the livelier ones. Although cats are quite independent creatures, most enjoy a quiet lap to sit on and some fuss. Our volunteers are invaluable when we have nervous or convalescing cats, as they provide a reassuring presence just by ‘being there’. It is important that our cat cuddlers are aware of each individual cat’s requirements and can tailor their attention appropriately – what is right for one could be overwhelming for another. ‘Cuddling time’ is between 11am and 2pm every day of the week and our volunteers tend to stay for a couple of hours each time they come. We have plenty of toys and grooming equipment available for our volunteers to use. If you would like to volunteer, please contact the Office on 01553 618889 or pop into the Centre during opening hours (Mon-Sat 11am-3pm). You will need to be over 18 Years Old and complete a volunteering form and advise us when you are able to come – we will endeavour to accommodate your availability where possible. We will then arrange a date for you to attend for an induction with one of our cattery staff, so you are fully prepared before you start!